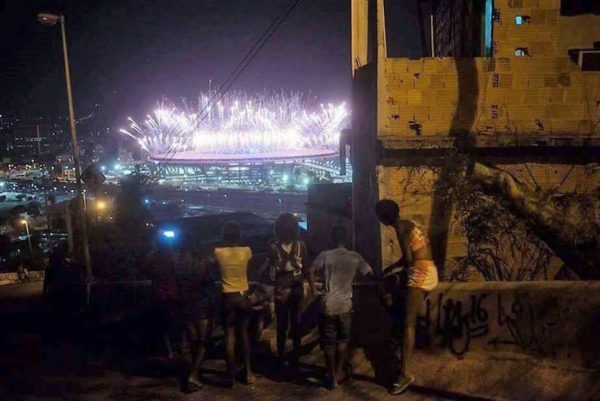 THIS One Photo of the Olympics Sums Up Everything WRONG With Society! Global events like the 31st Olympic summer games use A LOT of money for the spectacle. Even more money go for security and other necessities so the event can be played out safely. However, looking at the bigger picture, maybe the amount of money can be spent on something else which needs A LOT more of our attention. $4.6 billion has already been spent in creating the facilities for the 2016 summer olympics, which will be used for just two weeks, then forgotten, and when all other expenses are factored in, some $12 billion dollars will be spent on the show. This photo truly is like a scene from the popular movie Hunger Games, where an insanely wealthy and oppressive world elite live in stupendous luxury amongst a world packed with second class citizens who are deliberately kept poor by the vampiric economic policies of the rich and powerful. Thousands of people are starving just outside of view of the cameras, poor people are being violently hustled out of sight by riot police, and crimes of desperation of rocking the city, yet, in the Olympic arena, paid security is doing its part to shelter event-goers from the harsh reality of life in one of the world’s most troubled cities. The whole message about ‘we are one’ The Olympic Games share is beautiful. But instead of being just a message (even hypocritical in this case), it should be an example established by the same people who want the world to hear it. Events like this are beautiful. They teach us about The Spirit of Sport, about puting humanity first, before the competition. But if the whole event stands on the pillars of everything that it’s against, than I don’t see the point in making it.